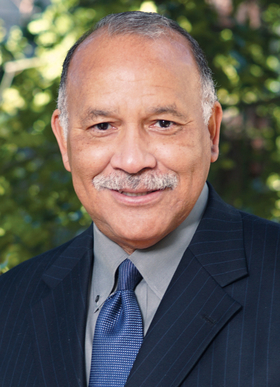 Mack Hogans is board chairman of Cambia Health Solutions in Portland, Ore.
Mack Hogans and the company whose governing board he leads, Cambia Health Solutions, are rooted in the same place—America's timberlands. Hogans spent a career in forestry, working his way up from forester to senior vice president at the huge forest products company Weyerhaeuser. He retired after 25 years in 2004. Portland, Ore.-based Cambia's background is also in the timber stands of the Pacific Northwest. Today, in addition to its core health insurance business, Cambia includes a family of companies that offer a variety of direct-to-customer services. Its predecessor company, however, began in 1917 in the logging camps and timber mill towns of Washington state, when loggers pooled money to pay medical costs for fellow workers in the dangerous industry. But that's about all Hogans and the company that would become Cambia had in common when he joined the board in 2002. Hogans had no experience in the health plan business, except as a customer. “I really did not know a lot about healthcare,” he said. And, like many customers, he took what he was told for granted—rarely questioning why his healthcare was the way it was. “If I would go to a doctor and he told me it was 2 o'clock, I didn't even look at my watch,” Hogans said. Since joining the board of what was then the Regence Group and particularly since becoming chairman in 2013, Hogans has helped lead the company's effort to make what executives there say is a fundamental change in the relationship between insurers, providers and patients. Cambia is out to question what customers want and need from their healthcare providers and empower them to drive the direction of their healthcare services. Hogans, 67, has embraced that consumer perspective, leading a group of other board members, many of whom are also from outside healthcare, to help smooth the path to a new customer-focused relationship, said Cambia CEO Mark Ganz. For his accomplishments and leadership role, Hogans is the recipient of Modern Healthcare's Excellence in Governance Award for corporate governance. Hogans said he's had to evolve into the role, given that his generation of healthcare consumers was conditioned not to be inquisitive. “I've learned to ask the questions,” the ones consumers perhaps should have been asking all along, said Hogans, who earned a degree at the University of Michigan and was raised in rural Alabama. Another member of the Cambia board who brings a customer-focused approach is Mike Koppel, an executive at the customer service-driven retailer Nordstrom. Koppel said Hogans is effective as a board member because he asks questions—and truly listens to the answers. Koppel, who lives near Hogans in the Seattle suburb of Bellevue, gives an illustration of how Hogans quietly goes about his various civic engagements. He recently ran into Hogans at a meeting of a powerful group of area business executives who work on local public policy issues.